Facet joints are small joints the size of your thumb nail, located in pairs from the cervical spine, thoracic spine and lumbar spine. They interlock with the vertebra above and below and provide stability and motion (rotation, flexion and extension) to the entire spine. Multiple conditions such as trauma, degeneration and post surgical changes can create significant inflammation in these joints. When this happens, it can produce neck, upper and lower back pain, buttock and which sometimes can extend to the arm and legs. 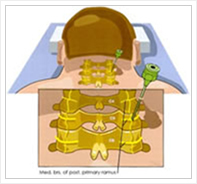 There are two main reasons to perform facet joint injections: diagnostic and therapeutic. The diagnosis of low back and neck pain can sometimes be challenging and inconclusive. Even with advance diagnostic imaging (such as CT Scan, MRI, X-Ray) and conventional tests (EMG, Nerve Conduction Studies) and a comprehensive physical examination, sometimes the source of the pain remains unknown. In this situation, facet joint injections prove to be an essential component in diagnosing and providing a more effective treatment. Second, by injecting an anti-inflammatory medication (steroids) in the joint, significant pain reduction can be achieved, facilitating physical therapy and chiropractic care. Ultimately restoring function and improving range of motion. Usually the procedure is performed under local anesthetic alone. Some patients that are apprehensive may benefit from intravenous sedation. This decision will be made based on individual preference and medical necessity. Oral medications are also available to assist with relaxation before and during the procedure. You will be taken to the procedure suite, place in the fluoroscopy bed lying on your stomach. Blood pressure and cardiac monitors will be applied. Next, your neck, upper or lower back area will be scrub and cleansed in a sterile fashion. With the aid of an X-ray machine, which provides constant imaging (called fluoroscopy), the specific area to be injected will be identified. The physician will then inject a small amount of local anesthetic in the skin and deeper tissues to numb the area. This may be associated with mild and brief stinging sensations. Once the area is numb, your doctor will insert a small needle into the appropriate facet joint, under x-ray guidance. A small amount of contrast ( X-ray dye) will be injected to confirm proper needle placement. Following this, a solution of local anesthetic and steroid (long acting anti-inflammatory) will be injected in the joint.